Before his inauguration, Donald Trump made two surprise calls to the Air Force general managing the Pentagon’s largest weapons program, the Lockheed Martin Corp. F-35 jet. 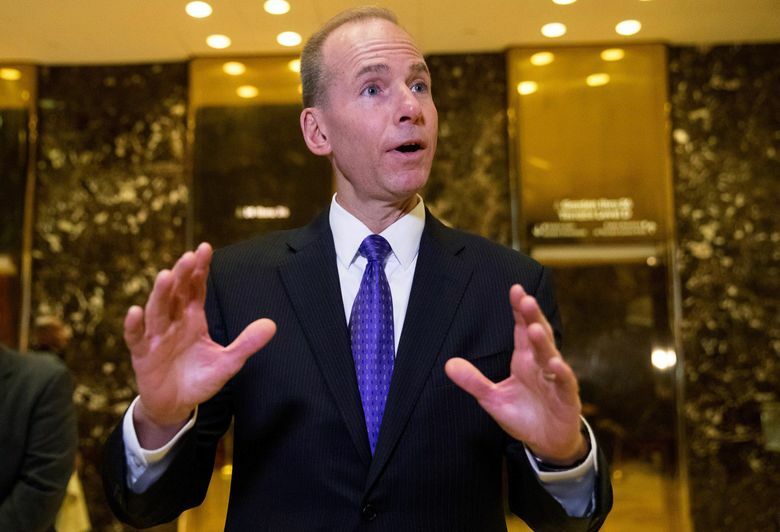 Listening in on one call was Dennis Muilenburg — the CEO of Lockheed’s chief rival, Boeing, sources said. Days before taking office, President-elect Donald Trump made two surprise calls to the Air Force general managing the Pentagon’s largest weapons program, the Lockheed Martin F-35 jet. Listening in on one of those calls was Dennis Muilenburg — the CEO of Lockheed’s chief rival, Boeing. Trump, who has repeatedly criticized the $379 billion F-35 program as “out of control,” made the highly unusual calls to Lt. Gen. Chris Bogdan on Jan. 9 and Jan. 17. Muilenburg, whose company makes a fighter jet Trump has suggested might be an alternative to the F-35, was in Trump’s New York office for a meeting during the second call. He appeared caught off-guard but was able to listen in on the call, according to two people familiar with the calls, who asked to remain anonymous discussing sensitive information. After speaking with Trump, Bogdan wrote two three-page memos, titled “phone conversations with President-Elect,” dated Jan. 10 and 18th and stamped “For Official Use Only,” to limit distribution, according to the people. The memos outlined Trump’s questions about the capabilities of Boeing’s Super Hornet fighter and how it might compete against Lockheed’s F-35C. About a dozen Pentagon officials were alerted to the calls after they occurred, the people said. Trump is expected to attend Boeing’s rollout of the first 787-10 Dreamliner at its South Carolina manufacturing complex Friday. Since winning election, Trump has emphasized his experience in real-estate negotiations as evidence he can get taxpayers a better deal on expensive Pentagon programs. Boeing, too, faced Trump’s wrath when he criticized potential spending on a new version of the Air Force One presidential airplane. But Trump’s calls to a uniformed program manager to discuss a contract that was completed 16 years ago were unprecedented and potentially disruptive, said a defense analyst. “When a president ignores the chain of command by going directly to a program manager, it creates chaos in the system,” said Loren Thompson, an analyst with the Lexington Institute in Arlington, Va., who’s followed the F-35 program since Lockheed beat Boeing in the winner-take-all contract in October 2001. “Behavior that looks decisive in the business world can unhinge a military organization that depends on order and discipline,” said Thompson, who also consults for Lockheed. After his Jan. 17 meeting with Trump, Muilenburg said he “made some great progress” in his talks with the president-elect. “We discussed Air Force One, we discussed fighter aircraft,” Muilenburg told reporters at Trump Tower in New York. Boeing spokesman Todd Blecher said in an email, “I have nothing to add to what Mr. Muilenburg said to reporters after” his Trump Tower meeting. Lockheed declined to comment. The White House didn’t respond to a request for comment. Bogdan first met Trump on Dec. 21 at his Palm Beach resort during an official visit by 11 military officers. He said Thursday that he wasn’t surprised by the calls from Trump, who had made it clear after that meeting that he’d be “reaching out” with more questions. Trump has shaken the defense industry — and put all large U.S. companies with government contracts on notice — with his frequent Twitter posts about business issues. There’s probably not much Boeing could do to make its jet comparable to the F-35. The two aircraft have different capabilities and mission requirements. Moreover, in an effort to drive the fighter’s costs down, the F-35 has been marketed to allies around the world, with production and maintenance contracts spread from the U.K. to Australia.